I was playing around with ideas this week for my Mom & Me Valentine class coming up on Saturday, February 10. I had several alternatives to choose from and the first was the cuteness of A Little Wild, which produces the little wild animal tags when die cut with the Little Loves Framelits. I also had my latest Paper Pumpkin kit delivered, and the cute valentines in it make a great background for a little hedgehog, from the Hedgehugs stamp set or one of the pandas from the Sale-A-Bration reward, Party Pandas. 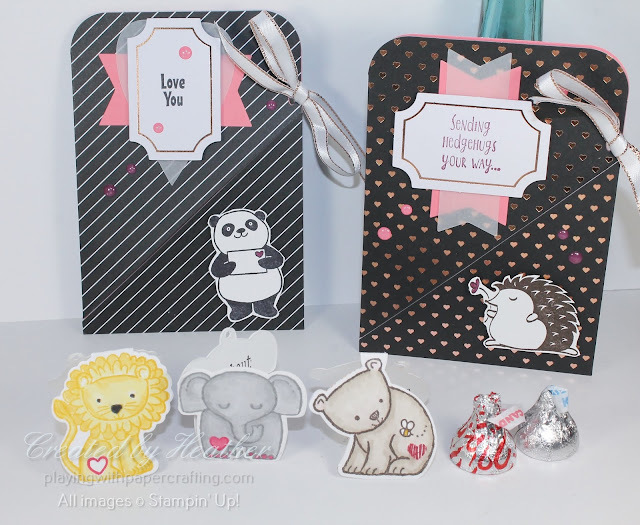 With the addition of some hearts from the Coffee Cafe stamp set and the sentiments that are part of the Party Pandas and the Hedgehugs sets, or the new Paper Pumpkin kit, I think I have enough ammo for a great Mom & Me class! 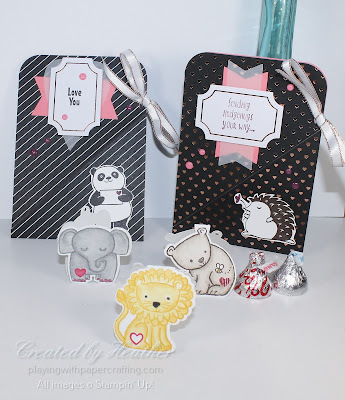 Those adorable tags from A Little Wild, turn easily into Valentines with the addition of either one of two tiny hearts from the Coffee Cafe set and two of the great sentiments from a Little Wild plus the To: From: stamp. They are pretty tiny though, as you can see from the comparison to a Hershey's Kiss. They were coloured using the Stampin' Blends, but as that colour bleeds through the Whisper White cardstock you have to die cut a second label shape from Whisper White to glue on the inside for the sentiment and the greeting. If I was doing this with the kids, I would stamp them on coloured cardstock instead of Whisper White and maybe just add one or two colour accents with Stampin' Right markers instead of filling them all in. 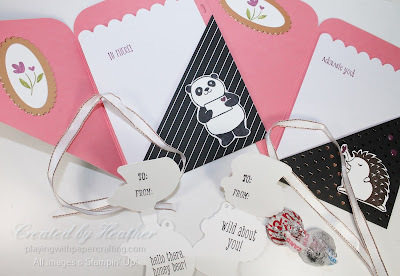 The Paper Pumpkin kit valentines I followed directions for except I used the images and sentiments for Party Pandas and Hedgehugs instead of the stamps in the kit and added a few more images. I am also working this week on my February newsletter, and, as usual, I will be including a free photo tutorial in the newsletter. It will feature the Petal Passion Designer Series Paper and show you how to use the new Stampin' Blends Alcohol markers. My photo tutorials include a list of supplies and measurements as well as links to where you can purchase any supplies you need. 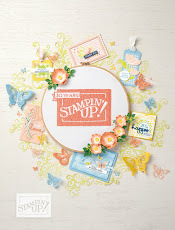 This next one will also have a video component for the actual Stampin' Blends colouring part. 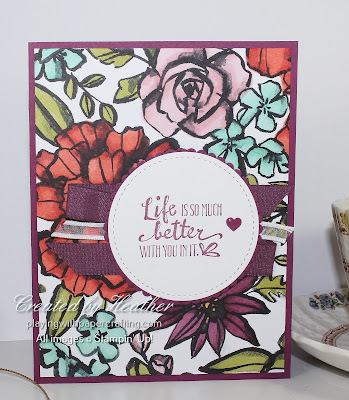 That background DSP is normally black and white, but I have made it colourful and the exact colours that I wanted, using the Stampin' Blends Alcohol markers. 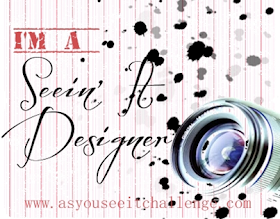 If you have been wanting to start using these but were reluctant to start because you didn't know what you were doing, it's easier than it looks, as you will find out in this tutorial. 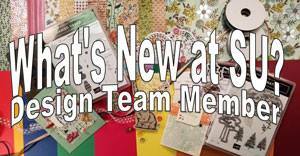 Also, if the price for the full set is daunting you, let me know here if you would be interested in being a part of a Stampin' Blends club, which will let you get a full set by paying in a set of 6 monthly installments. 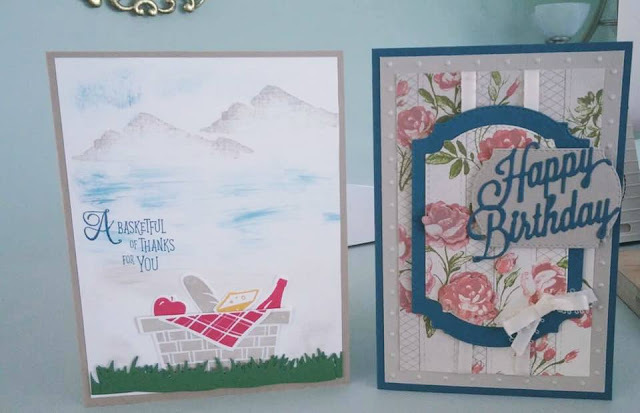 The card on the left is from one of my Papercraft Cats, Marion Hall, who was very clever combining the Picnic with You bundle with the Waterfront stamp set for a beautiful effect! The card on the right is from a good friend and stamping buddy, Eunice Stoneman, who is on a personal crusade to use up all her old DSP! She's doing an amazing job with it. Some of those flowers are fussy cut and added to the same images in the designer paper for a gorgeous 3D look. I love her colour choices with this one. 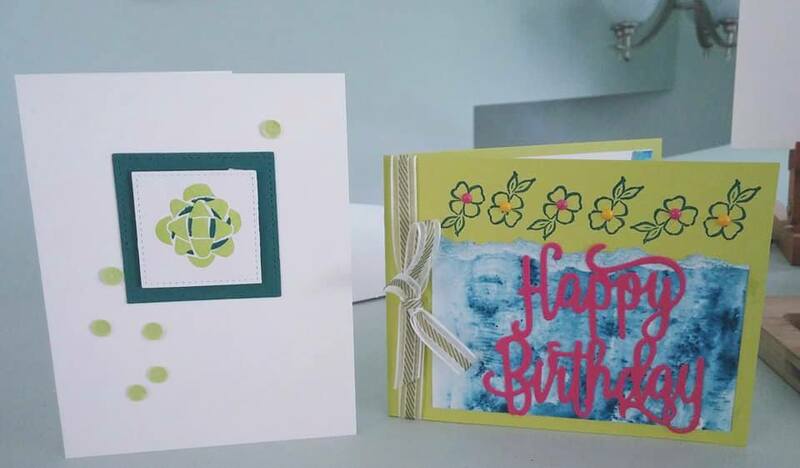 The card on the left is from a long time customer, Elaine Walker with a great technique, Triple Time stamping and a great classic stamp set, Betsy's Blossoms! 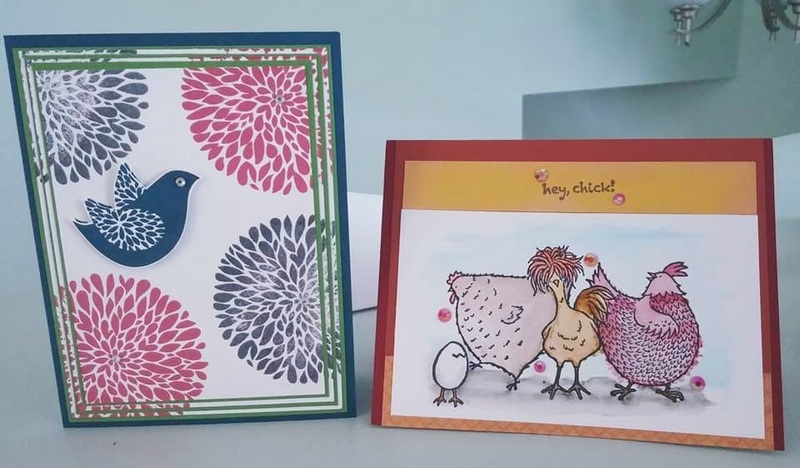 On the right, customer & friend Teri Coady sports up "Hey, Chick", a favourite from last year's SAB, with some beautiful water colour technique. Also that little egg is 3D! How cute! Two of my Papercraft Cats are featured here. On the left is Karen Bridden's lovely CAS take on the Picture Perfect Birthday stamp set! I love the colour combo she has chosen, and those self-adhesive sequins are the best, aren't they? Another team member and good friend, Doreen Austgarden went tropical in her choice of colours and textures here. 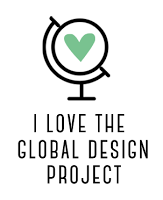 I love how the background for the sentiment looks like the ocean!